I'm moving house! Next Friday! I'm panicking! so much to pack...so little time. So to save me from going mad I'm closing my Etsy shop for a while. I need time to pack up, move and settle in. So please bear with me and I'll let you know the moment I reopen. P.S. I'm moving to Lewes in Sussex......a lovely market town set in the Sussex Downs. Almost halfway through the month already!! Where does the time go? So here late but not forgotten is Kit of the Month for May/June. Dandelions......in my opinion it's not a "real" garden without a few weeds!! As usual 50% discount and available in 1/12th and 1/24th scales. Both are available in my Etsy shop, the link is in the sidebar to the right of this post. Hope you have fun weeding your miniature garden! I'm so sorry to keep you hanging on for the winner, yesterday passed in a blur and oops I'm a day late!! 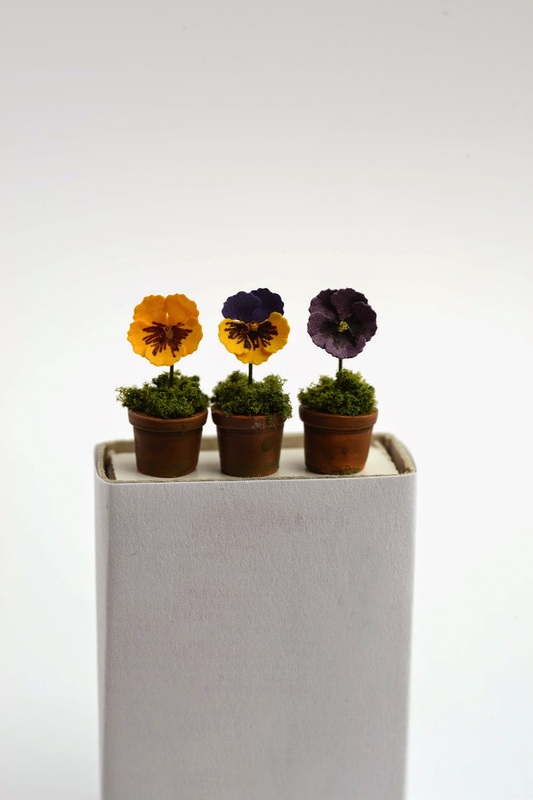 So, the winner of the Pansies is Jennybee who left a comment on the blog.....congratulations!! If you would like to e-mail me your postal address I'll get your prize in the post to you. I'll do another giveaway soon and thank you everyone for entering. I'm going away over Easter, so my Etsy shop will be closed from Thursday April 2nd until Monday April 13th. So to keep you busy while I am away I thought I'd have a Giveaway to celebrate that Spring is just about here!! 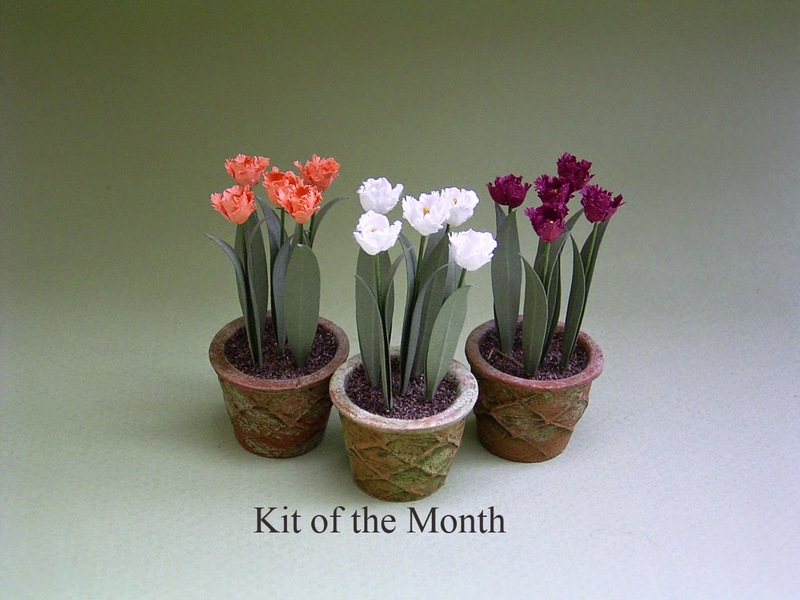 This time the prize is NOT a kit but 3 ready made 1/12th scale Pansies. If you would like to enter leave a comment under this post and for a 2nd chance leave a comment on The Miniature Garden Facebook page. There is a link on the right. The Giveaway will close at midnight British Summer Time on April 17th and I'll announce the winner on Saturday April 18th. At long last a new Kit of the Month for February 2015. Pretty parrot Tulips in a choice of 3 colours, £1.45 for the month of February. I'm back from holiday, no real disasters this time though the first day turned into a bit of a nightmare when a blocked pipe caused an upstairs neighbour's washing machine to empty itself into our kitchen. Did have a moment or two when I wanted to get back in the car and come straight home! Felt like King Canute as I tried to stem the flood of soapy water from reaching the wooden floors in the rest of the flat......mission accomplished and everything was sorted out that evening and the following morning. Have now left two insurance companies, the management company and our insurers to sort it out. And now to the important stuff!!! 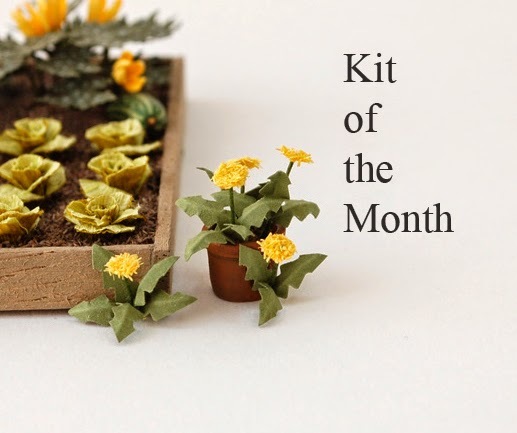 Kit of the month. 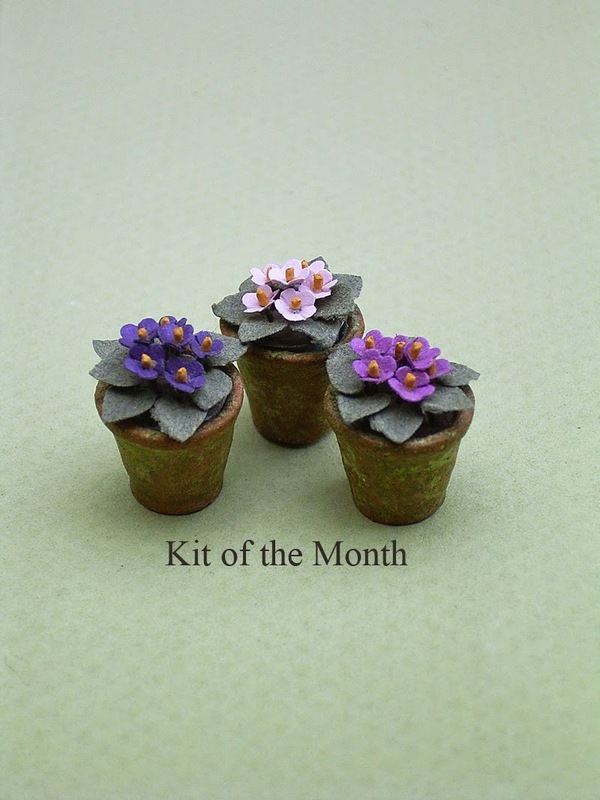 This month I've chosen African Violets, this kit makes three small plants, so it's ideal if you want to make gifts for miniature loving friends. Or if you belong to a dolls house club it's a project you can complete in an evening. 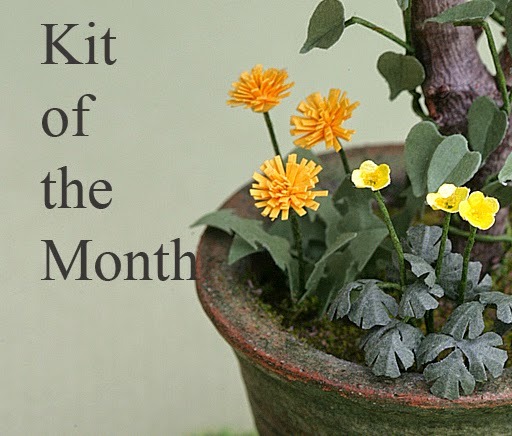 The kit normally costs £3.90 but for the month of October the price is £1.95. Oh yes, one more thing, here is an opportunity to get £5.00 discount off your first purchase on Etsy (from any shop) You must register first and it must be your first purchase to qualify. Go to the Miniature Garden Centre facebook page for the link. Congratulations to you both I'll be in touch to find out your postal addresses. And I'm sorry all the rest of you can't win too, thank you so much for entering and I'll be back with another giveaway in the not too distant future.